How much does it cost to mine 1 bitcoin - $1,200! We always believed Bitcoin was overpriced, now it appears that the cost of mining one Bitcoin is very, very high in energy terms. From ZeroHedge - "James Stafford, editor of Oilprice.com not only does the math, but explains the energy-driven geographic arbitrage currently driving bitcoin mining". 1. So, who is paying this bill? The yearly cost of the energy necessary to mine Bitcoin determines its economics. Cheap electricity is exactly what made China the Bitcoin mining king, but the economics are now moving to naturally cold areas like Iceland. But why pay for mining yourself? We read of increasing attempts to spoof your personal computers to mine bitcoins. 2. Where are the Green/Climate lobby in all this - they are usually after Energy intransigence like a very noisy rash, but have so far been very quiet on this, but if you search the Google there is nary a peep. Maybe they know that making a fuss will piss off a lot of their normal support and funding base? Predicting the French Election Round One - Job Done, but not Forgotten. Well, using our analytical systems we predicted that it would be Macron & Le Pen last Friday, and this Monday it is clear that this has come to pass. - The centre-right absorbs more of the far-right thinking, squeezing them, while the more centre-oriented followers stay with the rightward moving centre-right due to the of lack of a better home to go to. The latter has happened again (as it did in Holland), but the Macron-mule effect meant that the former didn't - Macron has managed to replace the Centre-Right and take some of the rightwards moving Centre-Left vote without shifting that far Right (yet). The big picture hasn't changed - our model said the 2nd round would go to the Far Right and Centre-Right candidates, and the Centre candidate should still win eventually, in theory. Also mapping a two horse race is simpler than a multiple horse one, even if it is very close. But "Macron the Mule" is not the original Centre-Right and still "anything could happen", so 538's predictions today that Le Pen is over are surprising given their experience in the US (the graphic at the top of the page is their prediction the day before the US election voting). While they are making a sensible prediction sensible based on the data so far, they are in our view premature as the 2 horse race has hardly started and the data has not really started to tell us what will really happen - we will need to take all the lessons of the first round into the second. Yet another Election to track and predict! 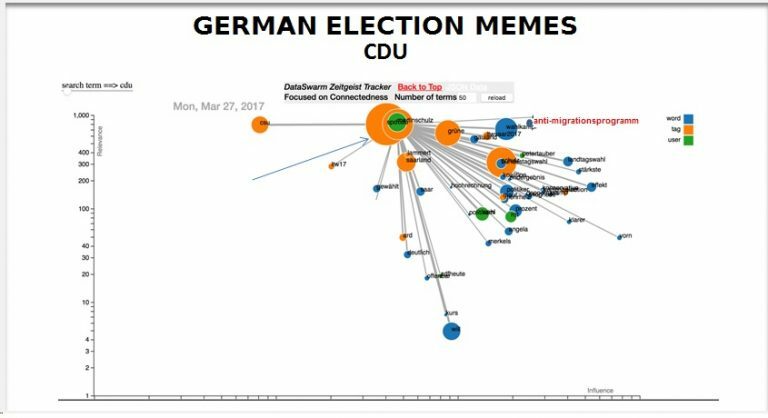 Above - our system busy predicting the German election - still far too early to tell very much, but this slide is showing examples of the Centre Right CDU moving rightwards. We had already set our systems onto watching the French and German elections, and will have something to say about the French Round One very soon. And now, courtesy of the UK Government, we have a UK election to track again too! As you may recall, we have set our analytic engines onto election watching for Brexit last year which we got right, and it managed to predict the Trump election result publically (see here). .
1, The main Centre-Right party moves considerably more Right, adopting quite a few of the Far-Right policies and narratives. We're seeing this in France, and starting to in Germany - see above chart. Arguably Theresa May's post-Brexit Tories have already done this. This ploy may lose some of its more centrist supporters (to who though?) but it prevents the Far Right from taking far more right wing supporters. 2. The Centre-Left is decimated, (This already happened to the Lib Dems, and to a lesser extent Labour in 2015 - so arguably it's happened already - but the reasons were different, Coalition Blues and Scottish Nationalism respectively). But in the Dutch election their "Deplorables" - traditional Labour working class voters in UK terms - went both left and right. Arguably Corbyn's Labour is already "more left" so will catch the Left-jumpers, but will there be a desertion of "Right-jumpers, and if so, where to? We assume the Scots will stay SNP unless a major shift in Labour towards Remain occurs, which is risky for them (see "Deplorables" above). Anyway, using this as the initial hypothesis for building a system dynamic model (although these days its called "machine learning", and if the hype carries on it will be "AI" by next year) it is then theoretically* possible to calibrate the social media monitoring we can do to look at cause and effect and the deltas, and refine the model and thus predict the outcome of an election. *We've done it already for US and Brexit, but there is quite a lot of judgement required for interpretation, and some luck - so "training" the system (and training ourselves to read it) is very important.